It was bound to happen. Back in 3rd Qtr of 2005 we went on TV and said this market is getting ready to hit some bumps in the road. We looked at the data and determined the Boom was over and it was simply a matter of time before the market reacted. In reality we started noticing signs in the 2nd Qtr of 2005, but everyone was busy rushing around trying to get their construction deals put together and finalized. We began pulling our investors out of projects in early 2005. We risked some commission dollars by doing so, but we just didn’t feel good about what was to come. We took a lot of heat back then. We heard things like “You can’t stop this market, it’s on fire” and “It’s a runaway train” etc. Most of us learned growing up that nothing goes up forever, but back then it was that herd mentality. It was quite common to go to a cocktail party and hear stories of average people flipping home after home and making $100,000 per deal. They were buying as many as they could, without a true end user in mind. We all know what happened to those days. Just as nothing goes up forever, nothing goes down forever either. If you read these articles regularly you know we’ve been predicting that about March or April of 2010 we could see prices actually rise over year ago prices and the headlines we would read would be quite different than what we’ve seen over the past 5 years. Well, Official numbers were just released this past week, and guess what? Prices are up 9% over last year. It’s not a miracle. If you’re unemotional and study the numbers you could see it coming. We’re not rocket scientists. Most Realtors have a good pulse on the market and can tell you what’s really going on. And just because the headlines read one thing, there can be many submarkets reacting quite differently or bucking the trend. You’ve heard that all real estate is local, and that’s true. Even in the Boom market some properties didn’t fare as well as others, and in the down market, some didn’t do as poorly either. Full time Realtors are on the front lines and see trends as they develop. Sometimes it’s beneficial to step back and analyze the numbers, and others it’s great to be right in the race and see what’s happening in real time. Sometimes it’s great to do both. Where will the market go from here? That’s a good question. Some speculate that the Home Buyer Tax Credit Expiration April 30 will have a negative impact, but we’re not so sure in SW Florida. Many of our buyers are scooping up bargains and don’t qualify for the credit anyway. We think home sales should continue their torrid pace as long as we have bargain inventory. 2009 set an all-time record and 2010 sales have surpassed 2009 sales. Our prices are artificially low, in many cases half or reproduction costs. This is why you see so few building permits being pulled. Because we are not seeing building activity, it is limiting employment in our area, which was so heavily dependent on the building and real estate industries along with related services. We don’t believe prices will shoot back up wildly until we create more jobs, and we may not create more building jobs until prices shoot back up. So it’s the old chicken and the egg theory. We think we’re going to have to find other employment opportunities to help lift our entire economy back up so we’re not so reliant on the building industry. Once we do that, the building industry will take care of itself. We would caution governments not to add impact fees and other costs that price jobs out of the market. We need to be more competitive, not anti-competitive. And finally, resist the urge to follow the herd. The herd is usually on right for a brief period of time, and usually at the tail end of the curve. Our market is Hot, and prices rose last month. We point out that even though the herd considers 2005 the Boom, there is more opportunity in the air now than there was in 2005. Misery was in the air, just few people realized it back then, and today opportunity is in the air, and the herd will realize it only after prices rise substantially in a few years. We’ve been talking quite a bit the past several weeks about HAFA (Home Affordable Foreclosure Alternatives) program and other programs designed to make selling a short sale easier. Going forward, these programs should provide some much needed relief for many sellers, and open up the market for more buyers. 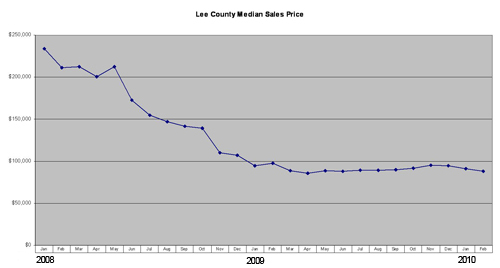 We’ve noticed a trend this past year developing in the Lee County SW Florida real estate market. As we’ve reported, sales numbers hit record levels in 2009, and prices look like they may have stabilized. 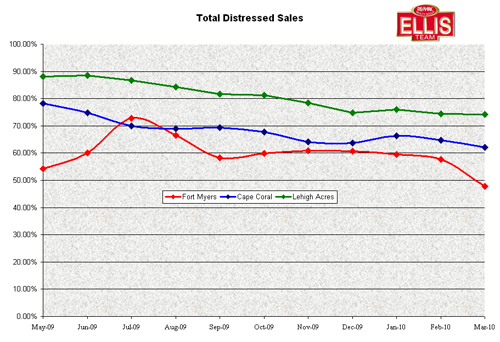 We’ve noticed that total distressed sales are down significantly since last May. Our definition of a distressed sale in either a bank foreclosure where the banks sells the property on the open market after they’ve foreclosed, or a short sale by a seller hoping to avoid foreclosure and protect their credit. Fort Myers is showing the most strength with only 47.83% of sales being distressed in March 2010. Compare that to Cape Coral at 62.0% and Lehigh Acres at 74.19% Lehigh Acres is down from the whopping 88.5% set last June, even though they have leveled off about 75% the past 4 months. Cape Coral has also declined, down from 78% last May to 62% now. This chart explains why prices have stabilized in Fort Myers and Cape Coral, and why Lehigh Acres is a little shakier at the moment. Inventory levels are down in all three segments, and sales are up significantly over February in Fort Myers and Cape Coral, and up moderately in Lehigh Acres. Officially sales numbers have not been released at the time this article was written, and we believe going forward we’ll see some median price increases in Lee County, and especially in Fort Myers and Cape Coral. We’re studying preliminary numbers, and we’re seeing an approximate 28% jump in sales over February numbers for single family homes. There was an increase in distressed sales, but the majority of the increase was regular non-distressed sales, and this is encouraging going forward in 2010. We’ll be keeping our eye on the market after the home buyer tax credits expire on sales after April 30, and on interest rates which are creeping higher. Nationally consumer confidence is rising, and eventually that should trickle into job growth. SW Florida has been hit hard with high unemployment, and we really want to study these numbers as ultimately employment will be the engine that fuels SW Florida real estate prices in the future. Always consult a CDPE (Certified Distressed Property Expert). Posted in Cape Coral, Fort Myers, Lehigh Acres, Southwest Florida Real Estate, SW Florida Bank Foreclosures. It’s a fact that 7 out of 10 distressed home sellers go into foreclosure without visible intervention to improve their situation. We speculate that sellers do not realize there is help available, and that doing something about their situation is better than just walking away. Many sellers we talk to are embarrassed about their situation, while others are simply depressed and don’t wish to speak about it, hoping their financial situation will improve in time to change things. The sad reality is once a homeowner falls behind; it’s very difficult to ever catch back up, even if their job situation improves. We’ve been reporting about the new government HAFA (Home Affordable Foreclosure Alternatives) program announced on April 5 designed to improve short sales. We’ve also told you that 2010 will be the year of the Transaction, either a short sale or foreclosure as loan modifications have not worked. This past week we’ve met several large banks who have all committed to diligently approving short sales in a quick fashion. 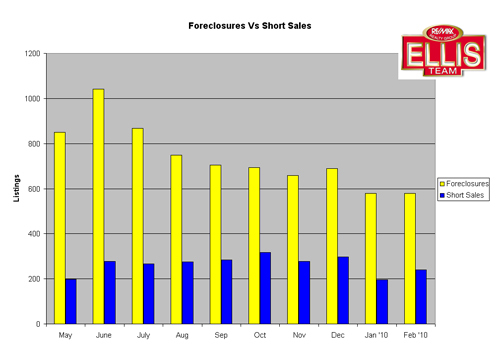 Many agents and buyers have been reluctant to offer on Short Sales because the truth was they were really Long Sales. This has changed and may now be a viable alternative for sellers and buyers alike. If your loan is with Bank of America, Wachovia, or Wells Fargo, it may now be possible to streamline your short sale. Other banks are following suit depending on who the end investor is on each loan. 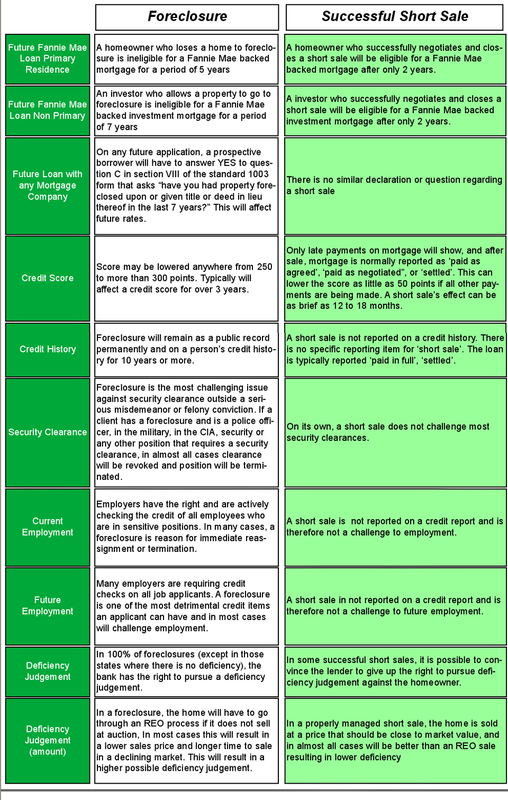 We’ve provided a chart for sellers to illustrate the financial advantages of considering a short sale VS. foreclosure. Some of the details may affect you well into the future. You may wish to discuss this with your attorney as well, especially if you’re considering bankruptcy. The good news is the short sale process has just improved dramatically, and while still very complicated, can provide relief for struggling homeowners and help them restore their credit so they can move on with their lives much sooner. This economy will improve one day, and it will be nice when current distressed homeowners can look back and not be held down by circumstances of the past. The short sale is one such tool to accomplish this. Posted in Southwest Florida Real Estate, SW Florida Bank Foreclosures. This past week we sat in on a meeting with the founder of RE/MAX, Laurie Magiano with the US Department of Treasury, Matt Vernon who heads the Bank of America Foreclosure and short sale department, and the president of Equator, the online transaction management platform for 7 of the 10 largest banks for foreclosures and short sales. The topic was HAFA, the government’s new initiative which stands for Home Affordable Foreclosure Alternatives Program. The government’s new plan is voluntary for lenders, and it does not include Fannie Mae and Freddie Mac owned or guaranteed mortgages as they are working on their own solutions to assisting and speeding up the process. The government’s new plan allows for homeowners to receive $3,000 for moving expenses if the seller agrees to a short sale or deed in lieu of foreclosure. A short sale or deed in lieu of foreclosure is better on the sellers credit than a full blown foreclosure and will allow the seller to purchase a home much sooner than a foreclosure. The plan also stipulates that the seller will not receive a deficiency judgment, so the seller won’t be bogged down with debt payments in the future resulting from the sale of the property. This is big as it’s been a stumbling block for many sellers in accepting a short sale. The seller’s housing expense ratio should exceed 31% or lender will believe seller can afford payment, and lenders will be particularly mindful of strategic defaults where seller has money saved but chooses to walk away anyway, especially on the higher loans. The new regulations, if the lenders agree, stipulates that the 2nd mortgage holder will receive 6 cents on the dollar, which is far more than a foreclosure where they won’t receive anything, and much more than the 2-3 cents banks sell debt for on open market. The 2nd lien holders have held up many short sales, and now that the government has set guidelines, it should make it easier having a roadmap to negotiations. The new guidelines also call for lenders to make decisions within 10 business days as to the viability of doing a short sale, and banks such as Bank of America are committing resources so that agents will now receive communications within 2 days, so the days of asking questions and not hearing anything for weeks or months may be over. Bank of America has put systems in place whereby an agent can contact a negotiator’s supervisor if the agent has not heard a response within 2 days, and the Treasury department has given us an e-mail address to escalate all inquiries no matter who the lender is so they can step in and help. Everyone in the room agreed that short sale transactions could one day outnumber foreclosures, and that would be a good thing as sellers credit is better preserved, and lenders generally lose less money on a short sale versus a bank foreclosure, and 2nd lien holders get paid something. The property tends to remain maintained and require less fix up than an abandoned or vandalized property, which further upholds values in the neighborhood. There is one other advantage few people think about to a quick process. Many short sales are priced too low and will never sell, but they subliminally drive values down in the market as some view the unsalable short sales as the new market value when in fact they’re artificial and won’t be approved. By speeding up the process, or issuing pre-approved pricing, this should help alleviate this phenomenon and improve the market almost immediately. Stay tuned as these are lofty ideals, and we’ll report back on how well they actually work. Of course, this will depend on how many of the lenders and investors participate in the voluntary program. See our Future of Real Estate Show discussing new HAFA program on short sales. SW Florida Real Estate Market Market Up, Down, or Sideways? This is the age old question everyone asks. How is the market doing? Have we bottomed? When will prices go back up? When will my home be worth what I owe? How long until we get back to 2005 prices? Should I sell or rent? Actually we get more questions than this, like should I pay my mortgage, should I pay my homeowners association fees, etc. We’ll stick with the value questions for this article. We’ve included a graph illustrating median prices since 2008. Median prices don’t tell the whole story, but they do tell a story. The definition of median price is half the sales are over and half under a certain price. As you can see, prices have fallen sharply since January 2008, and even more dating back to 2005. Ironically, home sales are up and setting records precisely because home prices have fallen. We’ve explained this in depth in past articles. The average price gives us a little more depth to the market and helps us understand the overall breath of the market. As we’ve been saying for quite some time, we expect higher priced foreclosures and short sales to actually pull the median price up, and we believe this will occur. This past week official numbers were released, both statewide and nationwide. Prices actually fell 3.3% vs. last month, and were down 9.74% from last year. Some might ask if we do all this research, when will our predictions come true. Our best estimates have been we could see year over year price increases as soon as March or April data. March data won’t be released until next month, but keep in mind these are only predictions about the future and nobody knows for certain. We are fairly confident this will occur; the question is more of when. 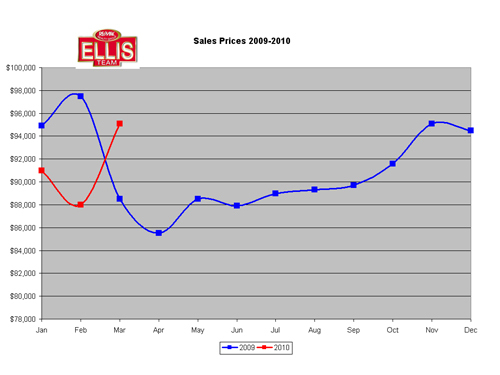 We have been looking at both median and mean average sales price data and it appears that prices for both dropped since December 2009 as official data would indicate, however were are seeing some price increases in March data that would indicate this trend has reversed, at least temporarily. Keep in mind we have many more closings that occur at the end of a month that could skew the data, but the trend looks good. We would also expect sales this time of year to be higher as our Northern visitors are here and buying property as well, and many of these sales are in the higher than median price range. Many of these sales will occur past March into April and May, and many will come back and buy in the summer. Ultimately prices will be determined by jobs and the economy. As more people get back to work, it should slow the foreclosures, and bring more people to the area. When will this occur? I think it’s so much easier to forecast prices in the short term than predict the overall economy. Congress has been focused on health care and the climate more than the economy, so it’s really hard to predict what’s coming out of Washington and how it will affect us and the economy, especially since we’ve largely been kept in the dark until something passes. We would encourage our government to turn its attention to actually helping the economy, or get out of the way so small business can begin creating jobs and getting us back on our feet. Once the economy starts looking up, Main Street can begin to recover and prices can begin to rise. Our prices are artificially low, and they won’t stay that way forever. Prices are well below replacement cost, so builders are on the sidelines now as they don’t wish to build at a loss. Our market will increase in value perhaps 40-50% before this occurs, and this is why buyers today have a chance at building substantial equity quickly. Once the dust settles and our market reaches price equilibrium, builders will be building again, bringing more jobs to the area and sustainable price appreciation. Good times await those who buy now and ride the coaster on up to equilibrium. Be sure to check our latest video on the Flood Insurance Crisis affecting home sales.